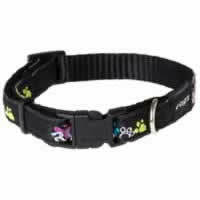 The Small (or Jellybean) Fancy Dress range of ROGZ collars is for those of you who want to stand out from the crowd and not happy to be Mr Average. 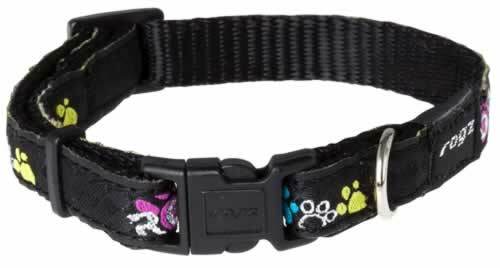 A wide range of cool graphic ribbons are stitched onto high grade webbing, ensuring your dog sports the latest and greatest designs. ROGZ rounded contoured plastic components ensure that every ROGZ collar fits as snug as a pug in a rug. With RogLoc, the Fort Knox of release buckles and is completely dog-paw resistant. Through a cleverly positioned load ring, Low Load Technology reduces the load on the buckle. Sporting a custom designed die cast ring (no welding). Electroplated chrome for a rust and tarnish free finish. Available in a range of colours/designs.